The goal of this project was to find a way for Mr.Cade to communicate with his students more effectively. He specifically wanted to use technology to actively interact with students. Mr.Cade was wondering how he could obtain each of their email addresses without having to enter each one individually. The second objective of this project was to update and revitalize his website, while adding features that would optimize the effectiveness to benefit his students. Instead of using emails as the primary source of communication, we introduced Mr.Cade to Remind, which is a multimedia tool that allows teachers to communicate updates and announcements with students via text. Since most students these days are always on their phones, we thought that this would be the best way to ensure that students stay up to date on upcoming tests, assignments,etc. What’s great about Remind is that it hides the user’s phone numbers, and assigns them another number to use for texting. Even if the student does not have a phone, they can join the Remind classroom using their email. 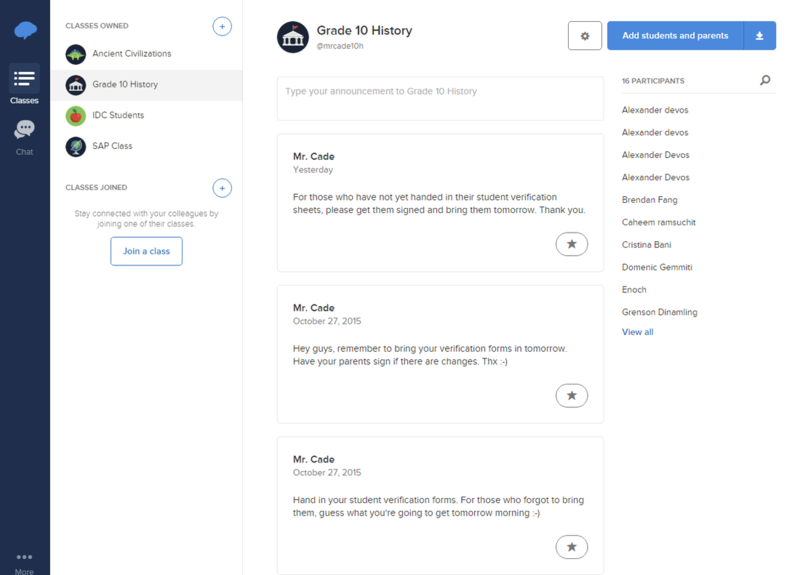 Remind is useful and extremely customizable as there are different privacy settings where you can choose to chat with students individually, per class or as a collective. We felt that a Remind is just what Mr.Cade needed and we created cheat sheets to help him use this technology in the future. We created a Remind class for Mr.Cade to communicate better with his students. As for Mr.Cade’s website, we updated his site so that it looked more appealing and fixed all the links that were broken. Additionally we reformatted certain pages to create a clean looking display and updated hidden pages so that they would be ready for his classes next semester. We embedded a google calendar into the site and colour coded it so that the student’s in each of his classes are clear on upcoming due dates and events. Finally, the Remind app was also embedded into the website for each class so that students can see all of the new announcements. 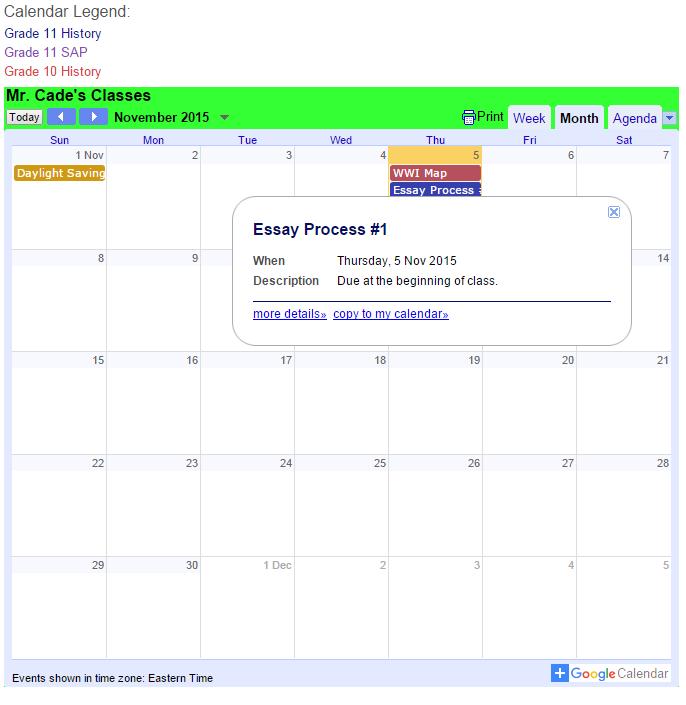 Mr.Cade has a colour coded Google calendar to visually communicate due dates/events to his students. Remind is a great way for any teacher to keep students informed on upcoming due dates such as tests, and events like field trips. It is also an effective tool for communicating everyday homework because texting is so easy and convenient. Also, teachers can attach files to their announcements, so if they forgot to hand out a worksheet in class, they can send it to their students immediately. Additionally Remind can be an easy and less intimidating way to interact with teachers for extra help, questions or requests (such as sending a copy of a rubric to a student). Remind can also be useful for extracurricular clubs. Google calendar is a useful tool that teachers can add to their websites to keep students up to date on tests, quizzes, assignments, etc. The description option on the calendar also allows teachers to add details to these events. For example, if there was an upcoming test, the description option would be great for listing out topics covered on the test. Google calendar keeps both the students and teacher organized on one shared platform and can be effective for any subject. Weebly is an amazing multimedia platform that teachers can use to create websites for their students to access course materials such as powerpoints, notes, assignments, etc. Simple to use and easy to navigate, Weebly is probably one of the best options if a teacher wants to create a website. We would recommend Weebly for all subjects as the customizable options provide a variety of tools for any teacher.